Samsung India had launched its flagship device on April 26, 2013 and today HTC One is now officially available all over the country. Both flagship phones debut as King of Android Phones. 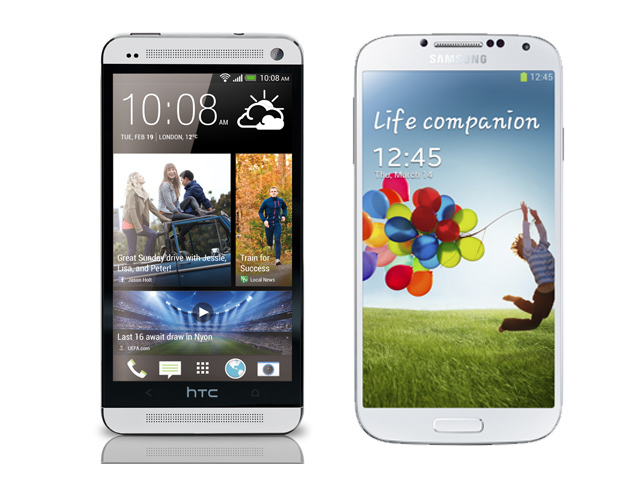 HTC One & Galaxy S4 loaded with powerful hardware & software enhancement. The Galaxy S4 equipped with 5-inch 1080 Super AMOLED screen covered with Gorilla Glass 3, 1.6 GHz Exynos 5 Octa, 2 GB of RAM, 13 MP Rear Camera & 2 MP front camera. Galaxy S4 loaded with some interesting features like S Translator, Smart Pause, Smart Scroll, Air View & S Voice. The HTC One equipped with 4.7-inch 1080p Full HD Display, 1.7 GHz Quad-Core Qualcomm Snapdragon processor, 2 GB of RAM, 4 Ultra pixel Rear Camera (Ultra pixel is equally powerful to S4 13 MP camera, read more here) & 2.1 MP front camera. HTC One main features are HTC BlinkFeed (Social Aggregator), HTC Ultra Pixel Camera with HTC Zoe (Better Sensor in Camera) and HTC BoomSound. When you compare hardware of both phones, you’ll notice that S4 is quite powerful than HTC One. But There is catch. Android OS still don’t support Quad Core, it means the Octa Core is useless in real life, you won’t feel major difference in Performance. Higher cores just bump Benchmark scores, actual feel remain same. HTC One edge out Galaxy S4 in build department and low light camera performance. HTC One crafted with new zero-gap aluminium unibody which makes gives HTC One a premium quality and it looks beautiful in hands while Galaxy S4 design is still same as other Galaxy phones, they still believe in plastics. HTC One camera specially designed to capture good photos in low light scene which makes its camera outperform all other phones even in lumia series. On the other hand, Galaxy S4 comes with MicroSD Card support & detachable battery which many of users wants in their phone, both of these features are missing in HTC One. Frankly speaking I don’t need MicroSD card support because 32 GB is enough and if you want more you can connect pen drive to export your data. But again its depend from users to user, whether they want MicroSD card slot or not. I’m sure Maximum people in India say ‘Yes I want’. Today’s Poll is that Which phone you like or looking to buy? HTC One or Galaxy S4. Hit the Poll below and if want to say anything, just comment.